Let's talk silver linings. 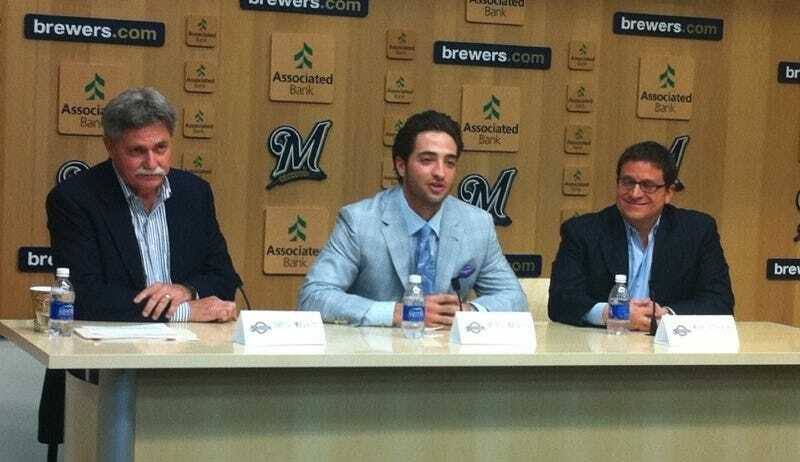 It is not the worst time for Ryan Braun to be suspended. The Brewers are out of the playoff race, and Braun could use the time to heal up from nagging injuries. Where he really gets hurt, though, is the "unpaid" part of his suspension—millions of dollars, down the drain. But where's it going? The short answer: the Brewers will pocket it. The remainder of Braun's year amounts to 65 games missed, or a shade over 40 percent of the season. Braun's salary for 2013 is just $8 million (it's set to skyrocket over the next few seasons), but he'll still be giving up a hefty amount: about $3.4 million. When MLB fines players for their roles in fights or confrontations with umpires, those fines are donated to charity. But baseball fines are small potatoes—Mike Gonzalez was docked $1,500 for his role in a Red Sox/Orioles brawl a few years back—and fines are not the same as unpaid suspensions. An MLB spokesperson tells us that in cases like Braun's, the team simply doesn't have to pay the player's salary. This should mitigate some of the nonsensical "dopers should have their contracts voided" talk, because teams are already off the hook for the prorated man-games lost to suspension. And while the Brewers absolutely didn't want Braun to be suspended—the hits to ticket sales, merchandising, and PR are not inconsiderable—they just saved $3.4 million on a wasted season.